We all know how cold it can get in Bellingham. When temperatures fall, they plummet. When this happens, heating systems become the best possible investment that you could make. Homes are a getaway for most people; a place to find solace, tranquility, and a quiet escape after a long day of work. For this reason, people invest in all things that make their home the ideal place. That is why Furnace Installation in Bellingham, Ferndale, Lynden, WA and its surrounding areas is crucial. Marr’s Heating and Air Conditioning offers the best ductless heater installation and Furnace Installation in Bellingham, Ferndale, Lynden, WA. Quality services and experience are considered an item, and this remains true throughout our services. Our team is made of qualified, credible and reliable technicians with years of experience in furnace installation. With over half a century in the business, we have installed thousands of home heating systems. We have state of the art tools to do the job right in a professional and neat manner. We understand that the installation process can be frustrating. After all, you want privacy in your home. That is why we ensure that all of our jobs are completed in a timely manner. After all, your comfort is our priority. The process of Furnace Installation in Bellingham, Ferndale, Lynden, WA starts with an area survey. Our technicians work hand in hand with the homeowners and commercial building supervisors to draw up a work plan. The customer is always right. We ensure we make their desires come true. The area and rooms the furnace is supposed to service is evaluated. Once that is done, our technicians guide the clients on any modifications to be done in the respective rooms, including room insulation and sealing. The financial implications are discussed and it is after this, that our team gets down on doing what they do best, installing the furnace. We offer a number of product options for our clients to choose from. These include gas fireplaces, gas furnaces, high-efficiency gas furnaces and standard efficiency gas furnaces. They all depend on the service area and of course, the price factor. Marr’s Heating and Air Conditioning has over 5-decades of experience in the industry. This means that if it is an HVAC product, we have dealt with it in the past. 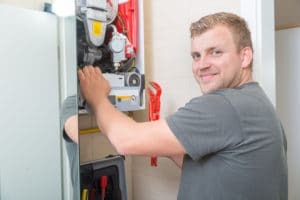 Needless to say, when it comes to Furnace Installation in Bellingham, Ferndale, Lynden, WA – you could not be in better hands. If you need Furnace Installation in Bellingham, Ferndale, Lynden, WA and its surrounding areas call us on 360-734-4455 or visit our contact page. Our technicians will get in touch with you and attend to your needs promptly. Also feel free to interact with us on our Facebook page. Also, check out what other clients say about us on our Testimonial page.